This welcome addition to the field of childhood bereavement provides a clearly organized overview of innovative and practical interventions for human service professionals helping bereaved children and their families in a variety of settings. Written by noted experts with over 40 years of combined experience, this comprehensive, “how to” book provides a framework for understanding how grief resulting from a death impacts the lives of children, and includes models, techniques, and interventions for individual, family, and group counseling. Based on best practices and the authors’ experience working with grieving families, this book describes how children are affected by the death of someone close to them, and provides a framework for addressing the needs of these children and their families and caregivers. The authors’ approach is straightforward and compassionate, and examples of children’s artwork reinforce the concepts discussed. Specific approaches are provided for individual and group support, including practical ways to create meaningful spaces for young people to find help, encouragement, and healing. In addition, the book offers a chapter on professional accountability, ethical concerns, and educational recommendations and training. Professionals who work with bereaved children daily, as well as those who only occasionally encounter them in their practice, will benefit from this book. "Understanding and Supporting Bereaved Children: A Practical Guide for Professionals by Andy McNiel and Pamela Gabbay is now required reading for my graduate student intern cohort here in Boston. I find it so useful and clear. It serves as a great introduction to those new to the field, and as a helpful affirmation to those of us who have been doing the work for a while!" "This book is exactly what the authors intended it to be: a practical guide for professionals who work with bereaved children. Andy McNiel and Dr. Pamela Gabbay have written a comprehensive text that clearly demonstrates their many years of knowledge and experience working in the bereavement field. The authors have put together a book filled with solid information relevant to current practice in the field of Thanatology as well as excellent examples that link scholarly information to practical use. They also provide many wonderful activities in the book which can be used by professionals who work with bereaved children. As a professor at a local university teaching a course in grief counseling, my students use this as their required text for the course. They have given very positive feedback on this book and appreciate the clear, concise way in which the information is portrayed. 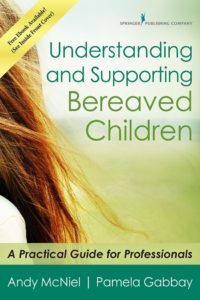 This book is a must for professionals wanting to know more about how to work with bereaved children." "I found this book to be a user’s guide to understanding both theoretical and practical information when working with grieving children. I really liked the entire set-up up the book, as the book was easy to understand and to use. I have already implemented some of the activities listed in the book."